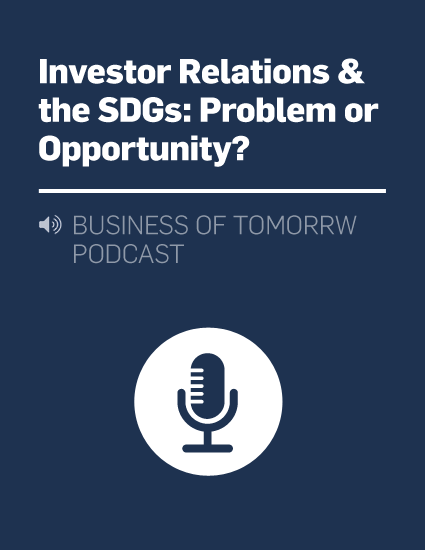 A 2015 survey of PRI signatory investors found that 84% of respondents would allocate capital to investments supporting the SDGs, and 89% would support regulatory reforms that promote the SDGs. Investors are starting to look at the SDGs as a way to address growth opportunities and manage risks. New tools are being developed to help institutional investors measure their alignment with the SDGs, such as the MSCI ACWI Sustainable Impact Index. With an estimated cost of $ 3-5 trillion per year to achieve the SDGs in developing countries alone, financial actors, including investors and companies are expected to interact within the financial ecosystem to direct investment and capital in ways that deliver both financial returns and public-goods outcomes. A new initiative, Catalyzing Financial Innovation, lead by the UN Global Compact in collaboration with UNEP FI and PRI will seek to support this by identifying innovative financial products that have the potential to redirect private and public finance towards critical infrastructure and sustainable solutions. Despite all this, recent research out of MIT Sloan report that only 24% of surveyed Investor Relations (IR) professionals are asked by their organizations to tell investors about the value of sustainability to the company’s bottom line. IR has a crucial role to play in responding to the growing appetite for sustainability information from investors and bridging existing communication gaps. Traditionally the IR function is responsible for the strategic, timely and accurate communication of the company's financial performance to the investment community. In turn, IR offers company management insights into capital markets to inform strategy setting and corporate decision-making. When IR is actively engaged and integrated into sustainability planning, companies will be better able to understand and respond to the interest that both mainstream and the so-called Socially Responsible Investors have with respect to the sustainable development agenda. Additionally, as investors increasingly integrate ESG information into their investment analysis, IR will bridge the demands of the investment community for research and engagement on the SDG agenda with the company's own priorities. Learn More About What the SDGs Mean for Investors and of Fiduciary Duty in the 21st Century. The level of investor interest in environmental, social and governance (ESG) performance has reached a point where many companies are starting to pay serious attention to requests for ESG information. Bloomberg has found that customers are increasingly demanding access to corporate ESG data. Responsible investment regulation is also on the rise. The PRI Responsible Investment Regulation database maps more than 250 measures across the 50 largest economies by GDP. This includes corporate disclosure, ESG integration, and pension fund regulation as well as investor stewardship codes. Stock exchanges are also increasingly mandating ESG disclosures through listing rules, and supporting companies in their sustainability reporting through guidance and training. 23 exchanges have committed to create ESG reporting guidance for issuers by the end of 2016 as part of the Sustainable Stock Exchange’s Campaign to Close the Guidance Gap. The number of ESG shareholder resolutions is growing. The total number of ICCR resolutions in 2016 rose by 15% compared to 2015. Recent research shows that when investors file a shareholder proposal on an ESG issue, the company performs better on that ESG issue and can even beat the market on the long-term. IR is starting to proactively communicate to mainstream investors on sustainability, through for instance ESG Investor Briefings. These are modeled after quarterly earnings calls, and aim to ensure that sustainability performance is sufficiently rewarded by financial markets. Cross-functional integration: In order to better communicate sustainability information and to better quantify financial value drivers of sustainability (such as total cost savings and revenue growth from sustainability-driven initiatives and reducing sustainability-related risk exposure) IR teams are working more closely with other functions such as the Sustainability and Finance & Accounting teams, by for instance establishing cross-functional working groups. Company Boards are increasingly being required to respond to shareholder concerns related to ESG factors, and have come under scrutiny by investment firms seeking to ensure that the Board of Directors fulfills its duty to oversee the implementation policies and procedures that ensure responsible business behavior. In these instances IR as well as other functions can play an important role in preparing the company Boards. Integrated Reporting: ESG information is increasingly being incorporated into communication with investors. The use of measurable and tangible figures for communicating environmental, social and governance information is one way to incorporate sustainability into IR while creating value. Integrated Reporting can be done by implementing models such as the Value Driver Model and the IIRC Integrated Reporting. Companies are increasingly interested in educating non-sustainability focused staff, including finance-focused, on these issues, and the role of CFOs in sustainability is a growing trend.